Quinoa has a number of benefits. In fact, this article goes as far as to list 27 benefits, backed by science. Thankfully, I won’t list out all 27 right now. But let’s focus in on two of the key ones that you should be interested in. Quinoa is extremely nutrient-dense. One cup (185g) yields a wide variety of micronutrients. And it’s these micros that will be doing wonders for your health and make you feel healthier. Of course you can have chips as your carb source if you really want. But you’ll be missing out on an array of extra benefits. Iron – Plays an important role in the production of red blood cells as well metabolising proteins. Zinc – Maintains proper function of the immune and digestive systems. Also reduces of stress levels and improves metabolism. Potassium – Counteracts the effects of sodium, which helps to maintain a healthy blood pressure. Magnesium – Can reduce symptoms from a variety of conditions such as fatigue and insomnia. 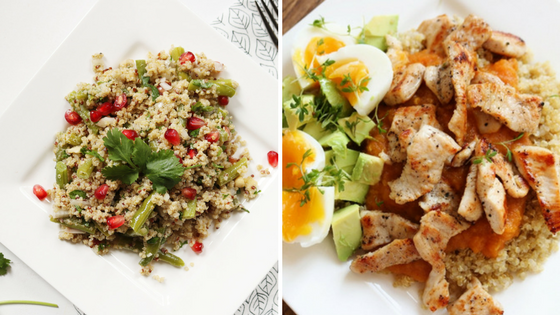 So use these quinoa recipes to maximise your micronutrient intake and gain all of these benefits. Calories in vs calories out is the most important aspect of ensuring you meet your weight and fat loss targets. Because it’s that calorie deficit that ultimately brings results. Quinoa can help with the process of weight and fat loss in a number of ways. For what is predominantly a carbohydrate source, it carries a reasonably high amount of protein and healthy fats. If you’re a vegan or vegetarian, these additional grams of protein make hitting those macros that bit easier. 185g of quinoa has just over 8g of protein. And to put that into context, it’s roughly twice as much as the same amount of white rice. On top of that quinoa is a slow-digesting carb. This means that you’ll get a fuller feeling for a longer period of time compared to other foods. And this is important as it reduced the likelihood of over-eating. And this little grain isn’t done yet. It has an abundance of dietary fibre (twice as much as other grains). Not only that, but it’s gluten-free, which is great for those with intolerances as well as the trendy hipsters. Finally, in terms of this list, quinoa has anti-inflammatory benefits, helping prevent disease. Cook the quinoa according to instructions on packaging and add in the green beans in the last 2 mins of cooking. Then drain and leave to cool down. Finely chop the onion and place it in a salad bowl. Chop the fresh parsley and coriander and add to the bowl. Once the quinoa has cooled add it to the salad bowl along with the pomegranate seeds, cumin, olive oil, lemon juice and almonds. Season everything with salt and pepper and mix well. To make the dressing, mix all the dressing ingredients together and stir into the salad. Garnish with more pomegranate seeds and flaked almonds to serve. Firstly, bring a large pan of water to boil. Cut the tomatoes crosswise and prick them on a fork one by one, then dip in the boiling water for 20 sec. Remove the skin, chop and place in a pot. Peel, core and chop the apple, chop the onion and slice the garlic. Then add the apple, onion, garlic, bouillon cube and curry powder in with the tomatoes and bring to a boil. Simmer for 15 minutes. Season with salt and pepper. Meanwhile, cook the quinoa according to instructions on the packaging. Heat the oil in a pan and cook the turkey until browned. In the meantime cook the quinoa. Remove the avocado flesh and cut into cubes, peel the eggs and chop then in quarters. Puree the apple-tomato sauce with a hand blender until smooth. Finally, divide the quinoa and turkey on the plates. And spoon over the sauce and serve avocado. So there you have it. While quinoa may have a bit of a bad wrap and is considered by many to be dull, dull, dull. It’s clear that this awesome ingredient can be elevated into something delicious. And not only that, it’s quick and easy to prepare. So there’s no excuse for bland meal plans any more.